The festive shopping season is in full swing, and so are the companies that are keen to get their wares in front of us as we look for that perfect gift for the important people in our lives. Monolithic online retailer Amazon has had an extremely busy Black Friday and Cyber Monday, offering some of the best deals that we’ve seen on the internet. 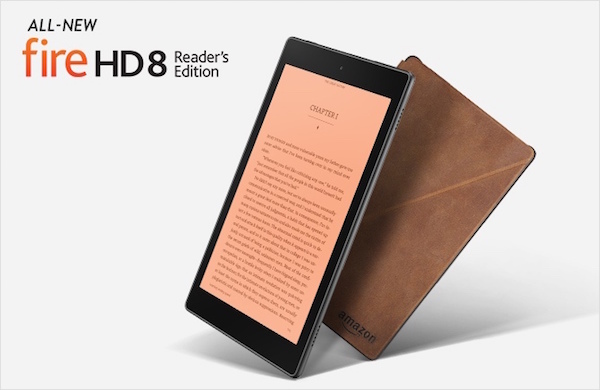 It seems that those deals aren’t over just yet with the company now announcing a new Reader’s Edition of its existing Fire HD 8 tablet that comes with a few perks for those purchasing it. Like most of Amazon’s tablets and dedicated eReaders, this latest offering on the Fire HD 8 tablet is aimed at those individuals who love nothing more than consuming written content. The offered Fire HD 8 bundle doesn’t come with a new, revamped tablet. It’s the same tablet that was initially introduced by Amazon back in September. The overall aesthetic and underlying technical specification of the gadget remains exactly the same. However, Amazon has put together a special bundle that is priced at $250, and offers distinct advantages to those who love to read. First and foremost, the online retailer is offering an entirely free year long subscription to the Kindle Unlimited service that offers unlimited access to over one million ebooks, including thousands of audiobooks. This particularly service is usually priced at $10 a month on a rolling subscription basis, and therefore immediately offers anyone purchasing this bundle an instant $120 saving. There’s also a limited edition leather cover that comes as part of the $250 Fire HD 8 bundle. The cover itself is a beautiful “handsome” brown offering and should not only add a certain layer of protection to the tablet, but also give it a great external aesthetic. If you were to purchase all of these items individually then you would be looking at parting with upwards of $350, making this limited time offer a no brainer for those who were looking to get amongst the Fire HD 8 tablet this festive season, either for themselves or as a gift for a loved one. The new Fire HD 8 Reader’s Edition is currently available to preorder directly through Amazon.com, and will start shipping this coming Wednesday in time for Christmas deliveries.